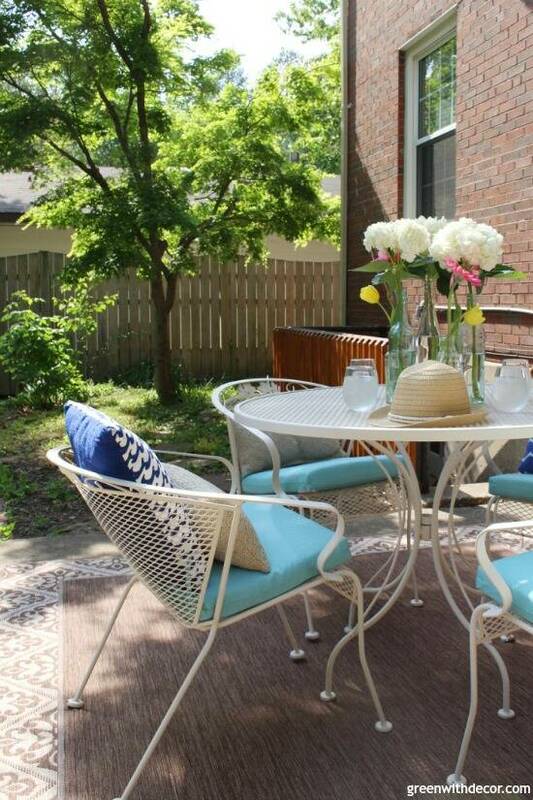 If you’re wondering how to paint metal patio furniture, it’s super easy with the help of a paint sprayer! Just follow this simple DIY tutorial. Disclosure: This post is sponsored by Wagner. All opinions, images and love of DIY painting projects are 100% mine. You know those outdoor DIY projects that just kind of bounce from one year’s to-do list to the next? That’s how painting this metal patio furniture has been for us. We’ve had it for years, and it was starting to rust and chip a bit … and we just never quite got around to painting it. Eek. Doesn’t it look all shiny and new?! I was debating going black again but figured since we were painting it anyway, might as well try out a new color. I wasn’t sure at first if the color was too light, but I like it with the dark outdoor rug and against the brick house. It really pops now instead of just blending in. 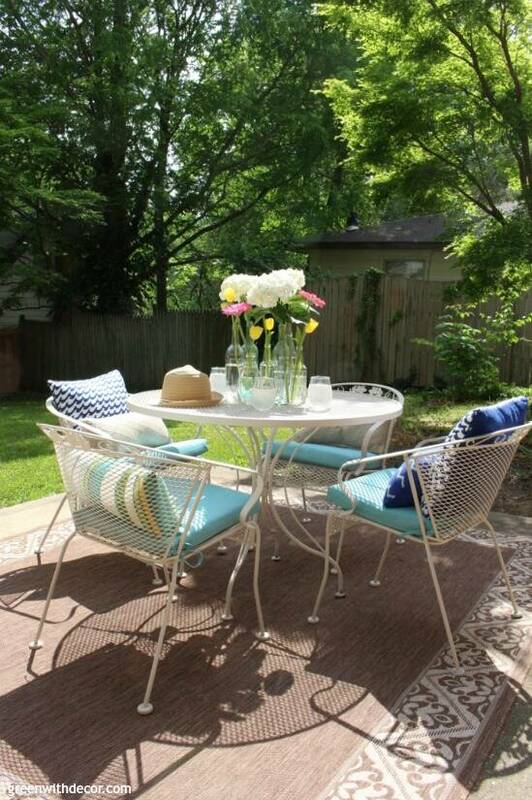 Painting the metal table and chairs was easy since we used our Wagner paint sprayer. I’m not even sure how insane you would go if you attempted to paint this by hand with all of the holes. I wouldn’t even try that route. The sprayer gave such good coverage. We used 2 cans of this Rust-Oleum primer for our table and 4 chairs. Most paint works just fine in the paint sprayer. We used Behr’s Exterior Satin Enamel in Old Map. We used about 1.5 quarts for our table and 4 chairs. 1. Clean your table and chairs. Especially if they’ve been sitting outside or in a dirty garage all winter. 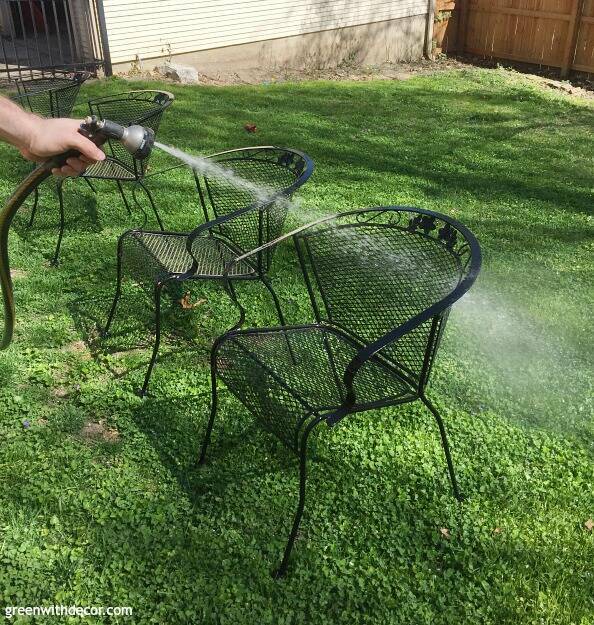 We sprayed our patio furniture down with the hose to get rid of dust and dirt. If you have a lot of rust, you’ll have to scrub it off before painting or it will most likely seep right back through. 2. Prime your table and chairs. Use your judgement if you need one or two coats. 3. Pour your paint into the sprayer. Stir your paint first, then pour it into the sprayer. You usually need to add water or a paint thinner when using a home decor sprayer on smaller projects, but there’s no need to do so with the FLEXIO paint sprayer. 4. Assemble the FLEXIO paint sprayer. Put the suction tube into the sprayer. If you’ll be spraying upward, the angled end should be painting toward the back of the sprayer, and if you’ll be spraying downward, the angled end of the tube should be pointing toward the front. Screw the paint cup into the sprayer. Twist the nozzle toward the ‘lock’ symbol. The Wagner manual is AWESOME at walking you through this if you have questions or if the thought of using a paint sprayer intimidates you (it’s easier than you think!). I walk through a lot of details of the FLEXIO in this post about painting walls with a paint sprayer, too. If you haven’t used a paint sprayer before, I’d recommend practicing on a piece of cardboard or scrap wood just so you get the hang of it. 5. Adjust your paint sprayer settings. I put this little diagram together so you can easily reference/remember what each of the knobs is for. Once you do a few projects, it’s easy to remember it all. Be sure to especially pay attention to the way the air cap is turned, depending on if you’re painting with horizontal or vertical strokes so the paint comes out of the sprayer in the right way. 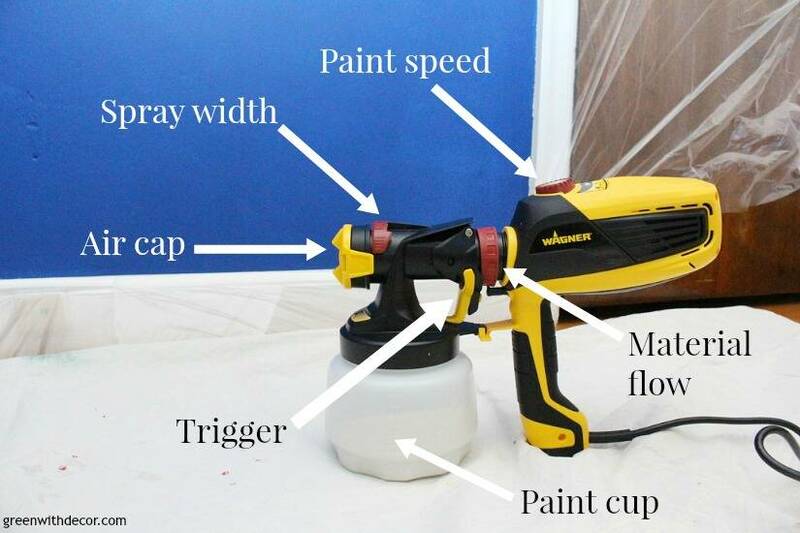 Again, Wagner’s manual walks you through everything or I have more details on all of the paint sprayer settings in this post on painting walls with a paint sprayer. Start at one side of your table (or chair), pull the trigger to start the paint flow and slowly move to the other side at a consistent speed. Come back across the furniture the opposite way, overlapping some with the paint you just sprayed. Keep going until your table or chair is fully covered. Move with your sprayer, don’t just flick your wrist or you’ll end up with uneven paint. Be sure you’re about 6-8 inches (it feels close!) from your furniture when spraying. Especially with the chairs, it was easier to flip them upside down to get the underside rather than trying to crouch down with the sprayer to paint the bottoms and the legs. This is up to you. The paint sprayer gives great coverage so it’s not really necessary, but since our table and chairs will be sitting outside in all of the rain, wind and weather, we did a second coat to help it stand up over time. FYI, I don’t often do a second coat on anything I paint with the sprayer inside. 8. Clean the paint sprayer. This is easier than it sounds, too. Run warm soapy water through the sprayer (don’t ever submerge the sprayer in water) and rub off any paint. Let it dry before putting it all away. It’s fun having the table and chairs a totally different color. So fun that it encouraged me to go a little crazy with new cushions and outdoor pillows, but hey, happy summer! Have you tackled any outdoor projects lately? Maybe if it’s also on your to-do list for the third year in a row, cross of ‘paint metal patio furniture’ this year! This sprayer would be awesome for painting a fence or garage, too!